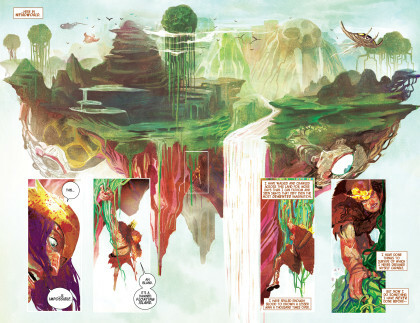 SETH’S PICK :: WEIRDWORLD #2: Trust me, I get it. Company wide events, crossovers, tie-ins, reboots, and the like can be frustrating, difficult to navigate, and time consuming to deal with whether you’re a fan, a retailer, or like me, both. Let’s face it, they’re not all going to be worth your time and money, but when there are so many being produced, a few will fall through the cracks and fail to get the attention they deserve. Thus, this Staff Pick. 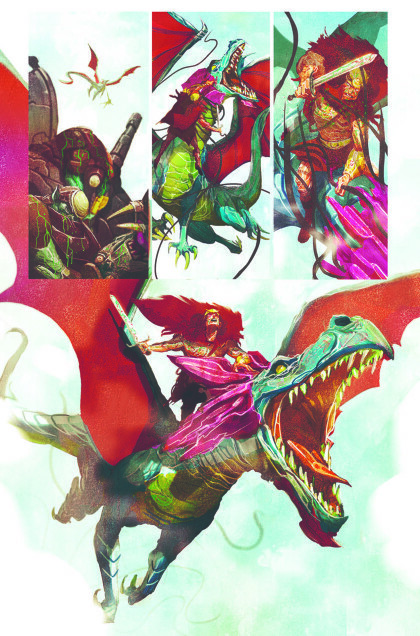 On the surface, Weirdworld may appear as just another ripple in the flood of the Secret Wars Battleworld miniseries. The premise is simple enough, with a lesser known character, Arkon fighting to escape his titular locale, while an array of beastly/monstrous hordes attempt to kill and/or eat him. It’s so simple that in lesser hands, this comic would certainly remain inconsequential. Fortunately for us, the creators bringing this story to life are Jason Aaron and Mike Del Mundo. Aaron remains one of the most reliable writers in comics, regardless of whether he’s writing his own creator owned Image books, or a Marvel series. Mike Del Mundo’s gorgeous art continues to impress, and is broadened here to include this series’ necessary fantasy elements. The creators also pull in lots of classic cult characters in this series, so if you’re a fan of Morgan le Fey, Man-Thing, the Lava Men, or Skull the Slayer, there’s even more to enjoy here. This may be just another Marvel event miniseries, but it’s one of the most enjoyable I’ve read this year. Issue #1 hit shelves just a week or two before HeroesCon, and I read it early one morning after a late night of processing comics for the show. It was the perfect little slice of stand alone, easily accessible comics that we rarely see amid these large publishing events. If you skipped Weirdworld because you assumed that it isn’t worth your time, reconsider that decision and pick up the first two issues this week. Sometimes simple fantasy miniseries can be the most rewarding reads.